This past Saturday we held our annual Volunteer Appreciation Dinner at the C.H. Nash Museum at Chucalissa. I am always quite humbled and grateful when looking at not just the number of volunteers but also what they accomplish over the course of a year. In the last year, our museum had a full-time staff of four, a part-time staff of four graduate assistants, supported by over 200 volunteers. Of those 200 volunteers, the majority are one time participants such as Scout or youth groups on service projects. Another 40 volunteers participate occasionally throughout the year. A core of 20 volunteers can be counted on like clockwork to show up on a scheduled basis. I reflected on a blog post I wrote last year titled “Volunteers as Mission.” In the post I noted that the primary reason we have volunteer programs at our Museum is not because we do not have enough staff to do all the things we need to do but because our very mission mandates that we offer participatory experiences for the public at Chucalissa. That participation often comes in the form of volunteer opportunities. Robert Ford of Wynne Arkansas who generously donated to the C.H. Nash Museum artifacts he surface collected from area farm fields over the years. Mr. Ford’s donated materials are also used in other educational programs at the Museum. Ron Brister and Richard Whittington are volunteers who examined the thousands of artifacts in the Ford collection and pulled a sample of a couple hundred to represent over 13000 years of prehistoric occupation in the region. They also donated and modified a beautiful map case to house the exhibit. Ron brought over 40 years of expertise to the project as the recently retired Collections Manager at the Pink Palace here in Memphis. Brooke Mundy, an undergraduate intern at the University of Memphis assisted with exhibit design and construction. She also created the panels for the exhibit and interviewed Robert Ford at his home in Wynne. 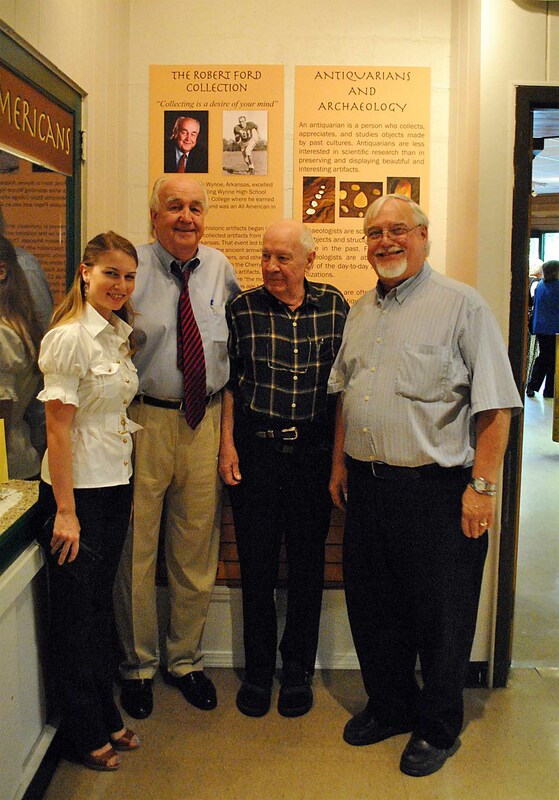 The Memphis Archaeological and Geological Society (MAGS) generously provided the funds to create the exhibit. MAGS has a long-term commitment to Chucalissa archaeology extending back to the early 1950s before there was even a museum at the site. Our museum staff oversaw the creation process, assisting primarily in logistics, exhibit text, and panel printing. Here is the punch line to the story. The assemblage of folks who helped create the exhibit provided both time and resources that are in short supply at not just the C.H. Nash Museum, but in museums across the country. But more importantly, each participant brought expertise and skills to the process that are not available on our regular staff. So, museums do not just need volunteers because there are not enough staff to do the tasks at hand, or because they are mandated to do so by their Mission Statements, but also because the volunteer brings to the museum skills, expertise, and resources not available with the regular staff. In my comments at the Saturday night dinner, I noted that the volunteers at our museum were absolutely essential to our operation. That is not just hype to make folks feel good about their participation. What essential skills and expertise do volunteers bring to your institution? You are right on target. Yes, our volunteers at the West Tennessee Delta Heritage Center help us stay open 7 days a week when we do not have enough staff, but more importantly they are able to share first hand knowledge about the area, the artifacts and way of life depicted in our museums and give insider info about the other attractions in the area. You can’t put a price on what they bring to our organization.